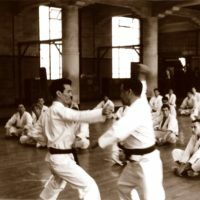 Mr. Ohshima’s travels took him to Mexico, through South America, and then on to visit his old Waseda Karate Club classmate, Mr. Harada. From there, he flew to Europe where he practiced and gave classes in several countries, visiting in 16 countries in total. 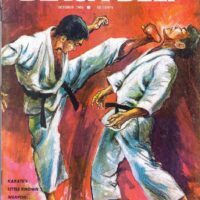 Karate was still new to Europe, but it was time for Mr. Ohshima to return to Japan after a five-year absence. 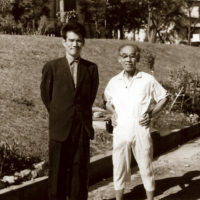 When Mr. Ohshima arrived in Japan, Senior Shibuya and Professor Ohama asked him to lead a group of five Waseda juniors, including vice-captain Sadaharu Honda, on a visit to Okinawa. 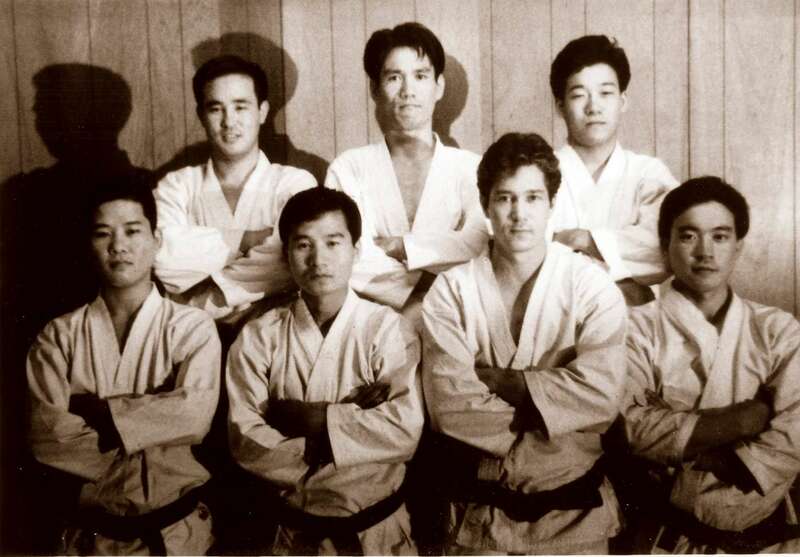 This was the first sports or martial arts group to visit Okinawa since WWII. Coincidentally, many of the leaders of Okinawa were alumni of Waseda University, so they were well received. 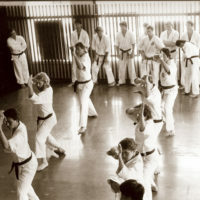 The group practiced at major dojos for ten days, visiting several famous karate masters, and appearing on television. 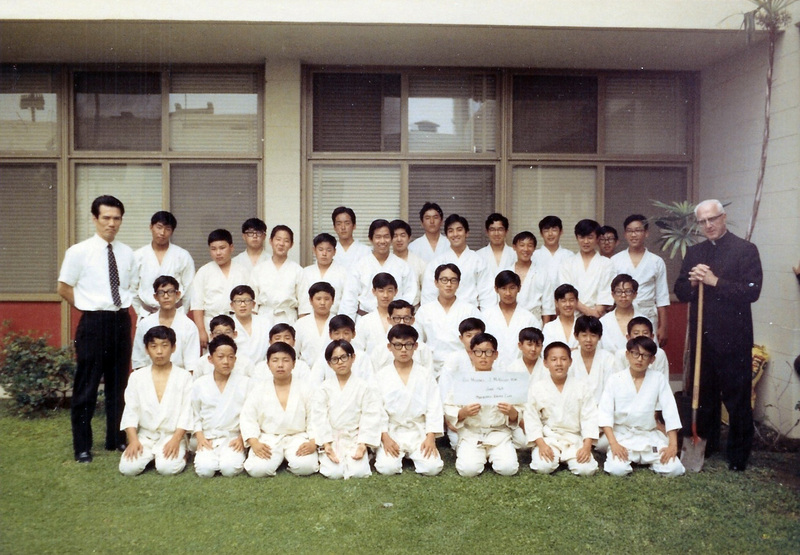 Among the groups they visited were the Ryukyu University Karate Club, Master Soken Hohan, and Master Choshin Chibaba. Caylor Adkins receives yoko-geri from Ohshima Sensei during black belt practice at Melrose Dojo. Caylor Adkins with 1962 Caltech Captain, Larry Shampine. 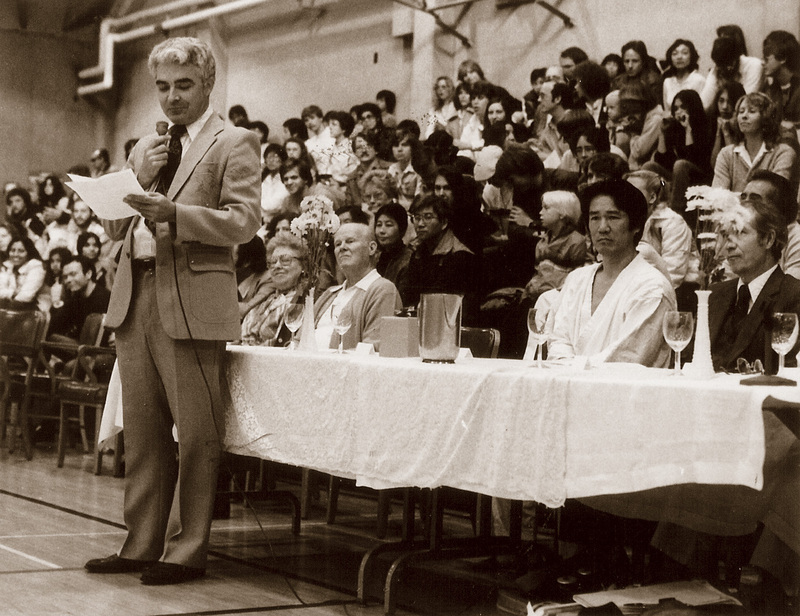 Caltech’s first Captain, Joe Stupak, introduces guests at the 25th Anniversary of the Caltech Karate Club in 1982. 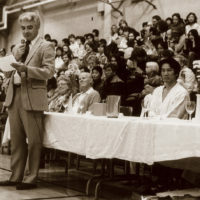 Coach James Nerrie and his wife are seated at the table with Ohshima Sensei. 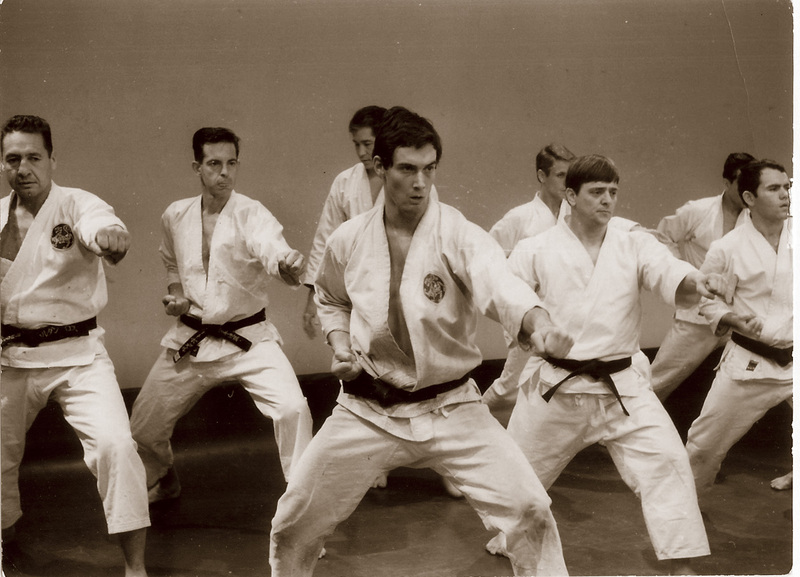 One of Caltech Karate Club’s early practices led by Floyd Herbert ca 1964. 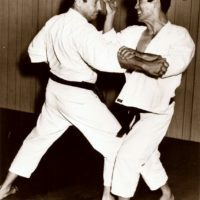 Mr. Ohshima executes the fumikomi from Bassai kata on Jerry Emery’s knee (1961). 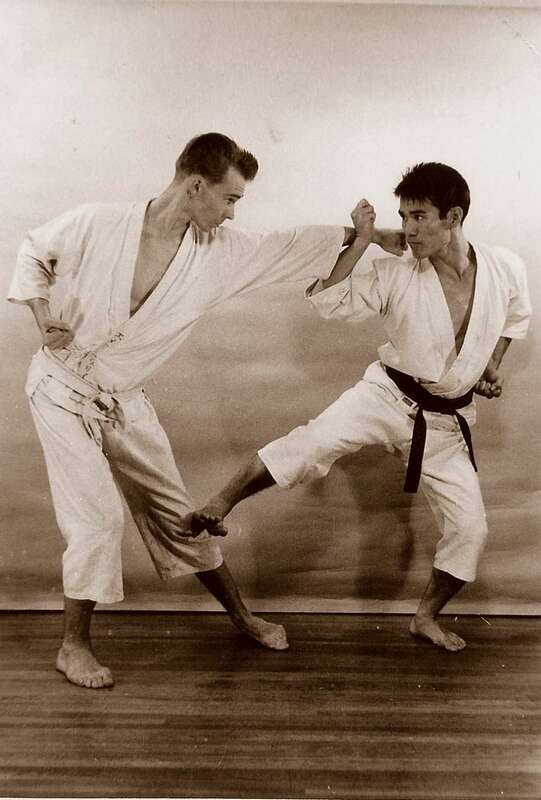 Mr. Ohshima executes a shuto strike on Jordan Roth, one of Mr. Ohshima’s first black belts. 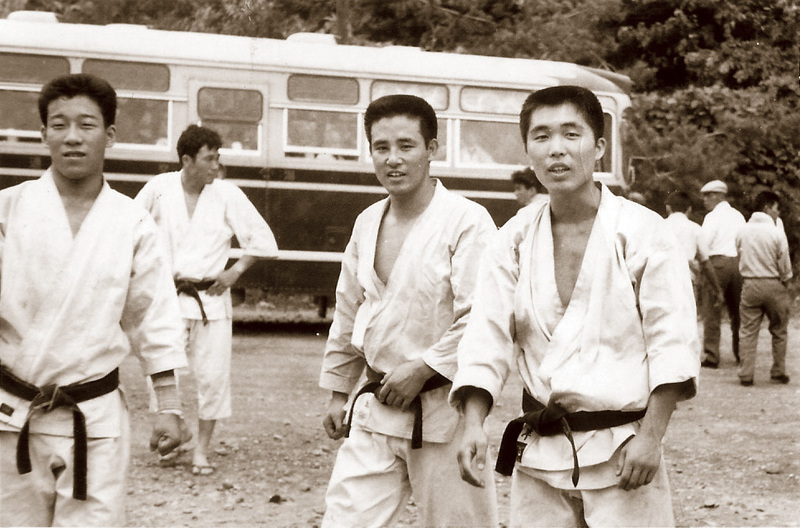 Mr. Naito and Mr. Ohara finish a practice at Special Training on Sado Island in 1962. 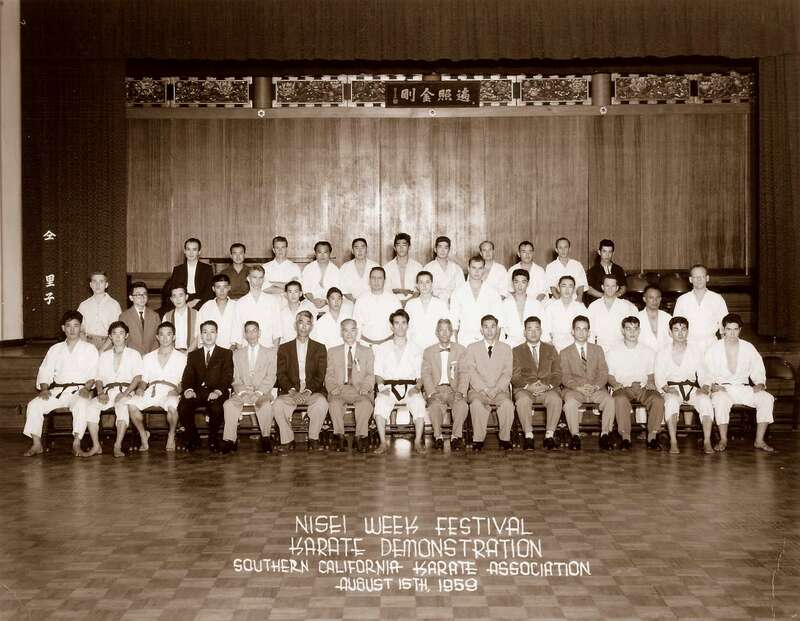 SCKA members pose with Nisei Week officials in the Koyosan Temple during the 1959 Nisei Week (3rd) Exhibition. 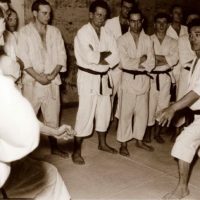 In 1960, after Master Funakoshi passed away, his family gave Mr. Ohshima the authorization to translate Master Funakoshi’s karate manual, Karate-do Kyohan, into English (and later into French). 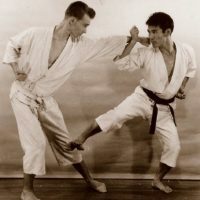 In the spring of 1961, Caylor Adkins decided to visit Japan to study karate at Waseda University. At the same time, Mr. Ohshima announced his forthcoming marriage to Yoko, his fiancée of five years, and invited Caylor to attend the wedding at the Tokyo Kaika. It was a busy spring in Japan as the Waseda members welcomed Caylor to their karate club. He was able to train directly under Captain Narushima, Mr. Suguira, Mr. Odera, Mr. Ohara, and Mr. Honda. Practicing hard at Waseda paid off and Caylor was awarded the rank of nidan at the dan test. In the meantime, Mr. Ohshima wanted to send two black belts to replace him in America. A black belt highly recommended by Senior Kamata was Hidetaka Nishiyama from the Japan Karate Association (also known as JKA or Kyokai). 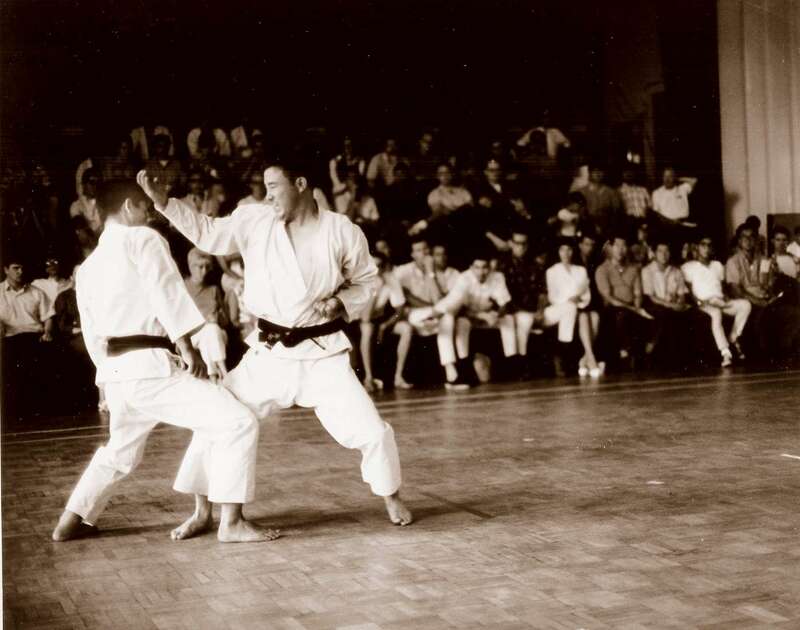 The SCKA could only afford to support one black belt and Mr. Nishiyama convinced Mr. Ohshima that he would be the one to uphold the teachings of Master Funakoshi and the SCKA established by Mr. Ohshima. 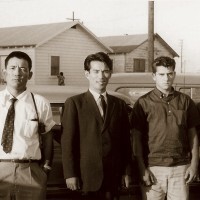 Caylor returned to the U.S. and Hidetaka Nishiyama arrived in August of 1961. Mr. Ohshima expressed interest in returning to America to work on the translation of Karate-do Kyohan. 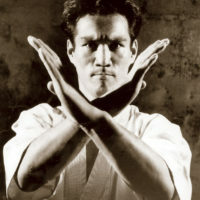 He aspired to be in a karate atmosphere, teach a couple of times a week, and translate the master’s text into English. 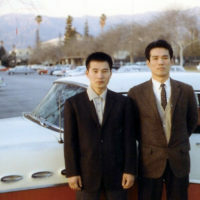 Jim Sagawa had joined the SCKA in June of 1961 and plans were being made at the Konko Church to welcome Mr. Nishiyama. Mr. Nishiyama proceeded to take over the responsibilities as the leader of the SCKA with an endorsement from Mr. Ohshima. 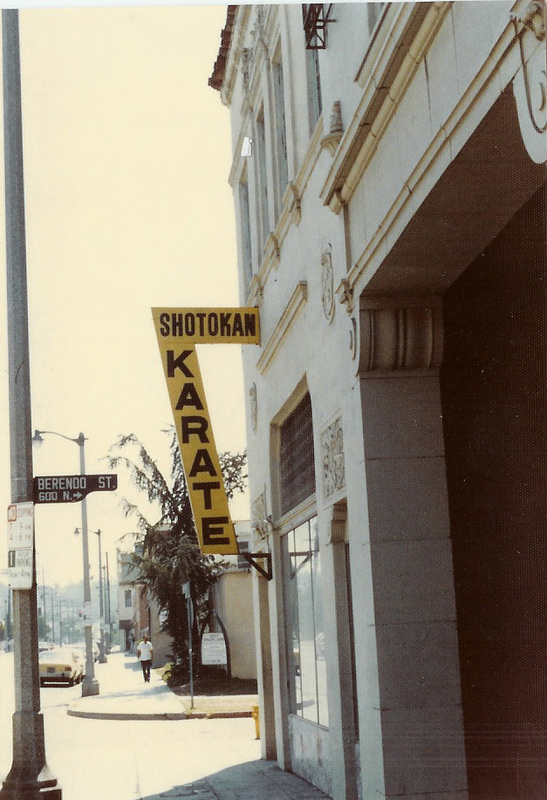 After teaching at several new dojos opened by SCKA black belts, he decided to consolidate them into one main dojo on Olympic Boulevard, in downtown Los Angeles. 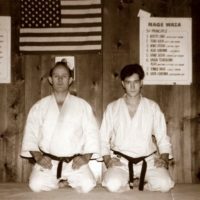 At that time, George Takahashi ran the Hollywood dojo, Ro Suzuki had a group in the Crenshaw area of Los Angeles, Jordan Roth had a group in West Covina, and Caylor Adkins opened up his dojo at the John Ogden judo dojo in Long Beach. 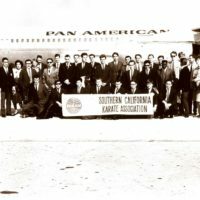 There were other affiliates such as Dan Ivan, who had a group in Santa Ana, a JKA group practicing in Oxnard, and a club at Caltech in Pasadena. 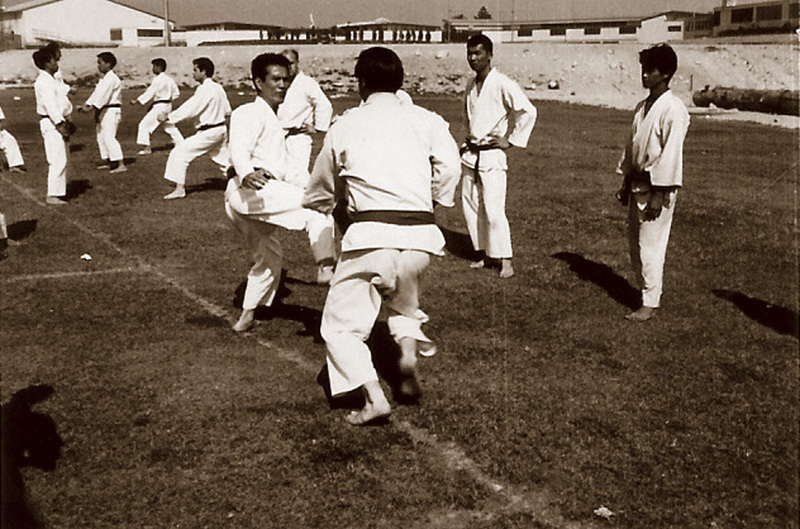 While the French Judo Federation was trying to get Mr. Ohshima to return to France to teach karate, Mr. Ohshima was planning to return to Los Angeles to work on the translation of Karate-do Kyohan. Nishiyama held a meeting with the Board of Directors and Council to vote on the subject of Mr. Ohshima returning. Many of the students who had practiced with Mr. Ohshima thought it strange that they needed to vote on this subject. 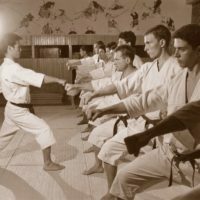 When the meeting took place at the Olympic dojo, 20 black belts appeared, including some JKA members from out of state. When the votes were counted, Nishiyama’s Council had rejected the idea of inviting Mr. Ohshima back to teach. Caylor Adkins and Byron Nelson stormed out of the meeting, and Jordan Roth protested the vote. 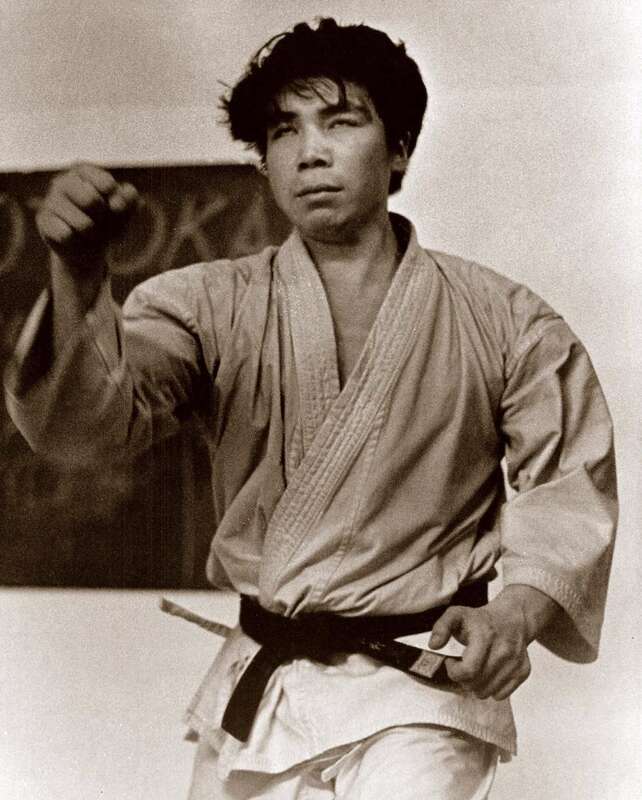 Many of Mr. Ohshima’s black belts were confused because Mr. Ohshima had endorsed Nishiyama. Mr. and Mrs. Ohshima accepted an invitation to Paris, France, from Henri Plee of the French Judo Federation. 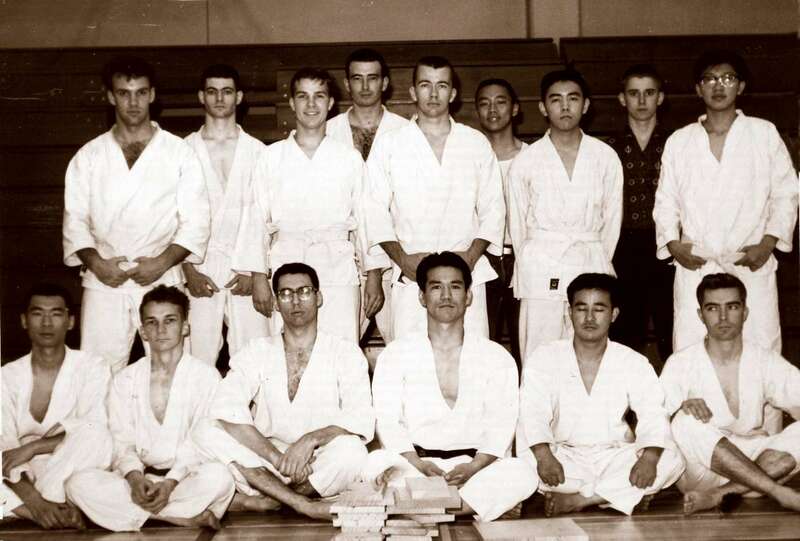 When they arrived in April of 1962, the response was incredible as 600 people signed up to train under Mr. Ohshima in one course. Many of the students who had met Mr. Ohshima on his first tour of Europe were present. Many serious students signed up for several courses with Ohshima Sensei. They were amazed at his techniques, his intensity, and his knowledge. 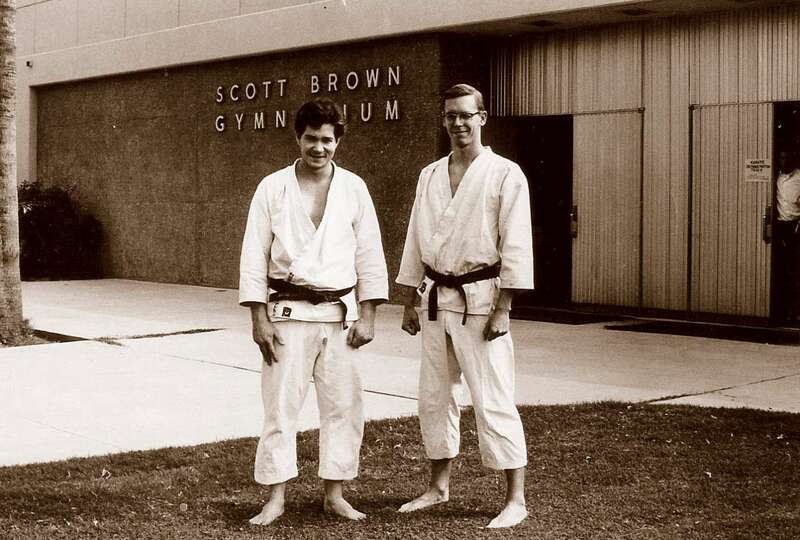 The black belts soon realized that they had to start from zero again. 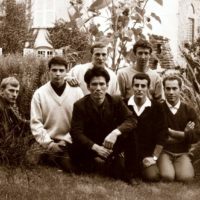 Some of these students later became the leaders of France Shotokan, including Daniel Chemla, JeanPierre Gerbaulet, John Lasry, and Alain Gabrielli. In September, Mr. Ohshima led the first Special Training in France with 12 participants. This small group of men had grown tough. Senior black belts of SCKA. 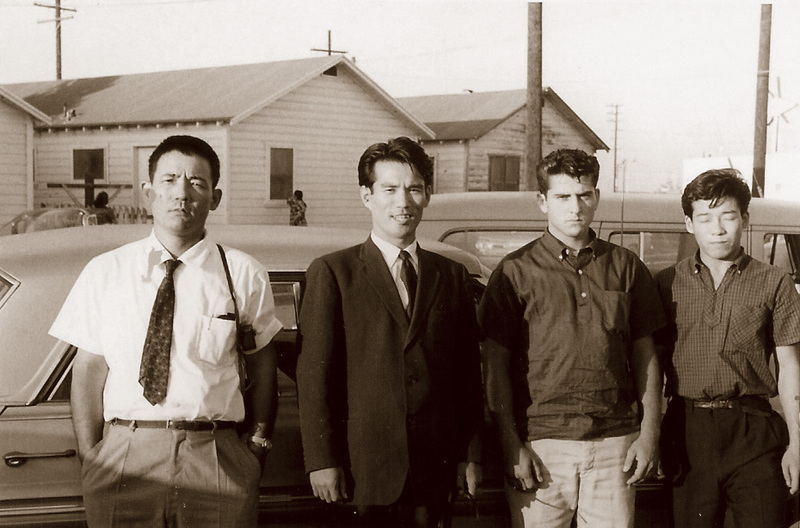 Front row l-r: Shoji Okabe, Yoshiaki Yamagami, Caylor Adkins, James Sagawa. 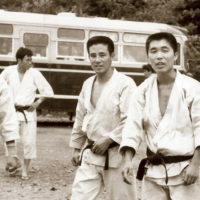 Back row l-r: Mamoru Ohara, Tsutomu Ohshima, Sadaharu Honda. 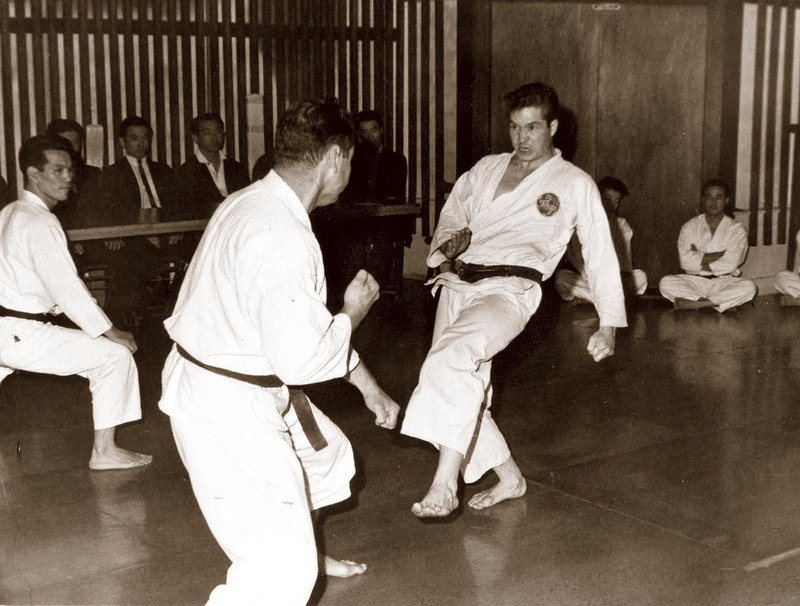 Caylor Adkins opens his Long Beach Dojo sharing it with John Ogden’s Judo Dojo in 1961. 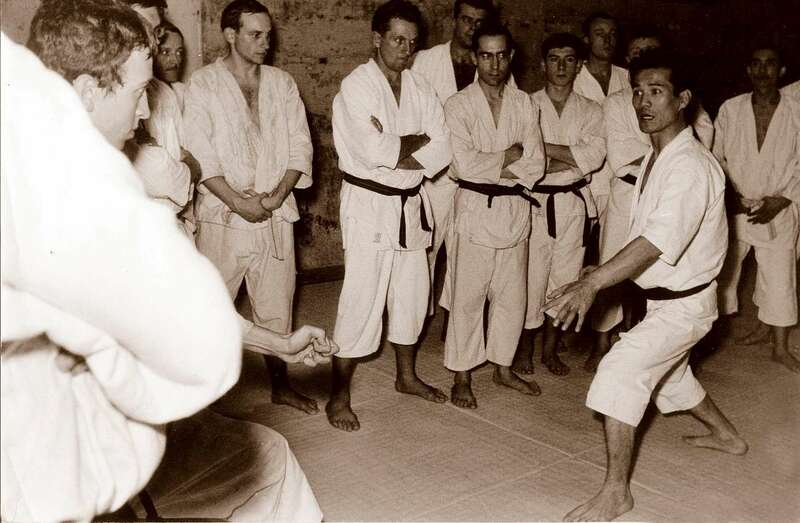 Mr. Ohshima faces Marc Bassis in a kumite demonstration (Paris, 1962). 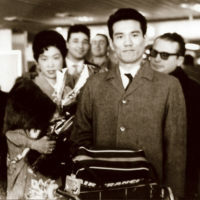 Mr. Ohshima explaining to a French group during his visit to France in 1962. The Melrose Dojo was opened up on the corner of Berendo St and Melrose Ave in what used to be the Normandie Kitchen restaurant. 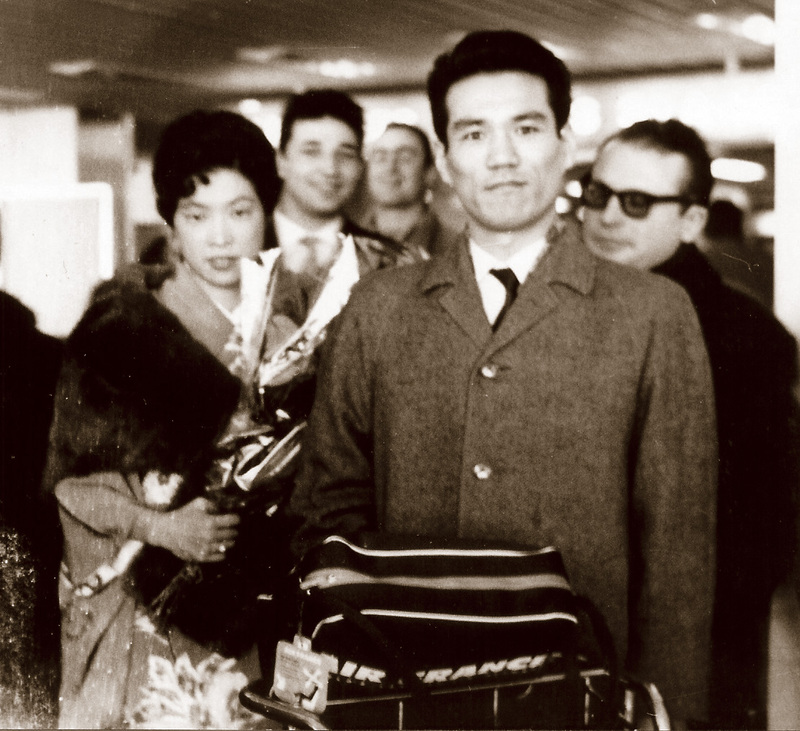 Mr. Ohshima was ready to enter the United States on a visa in December of 1962. Russ Innes had Mr. and Mrs. Ohshima stay at his house when they arrived during the end of the Christmas holiday. They had brought only two suitcases because they planned to return to Japan as soon as Mr. Ohshima cleared up the problems in the SCKA. As the new year arrived, it was apparent that 1963 would be a year of changes and struggles for the SCKA, and Mr. Ohshima would stay for good. 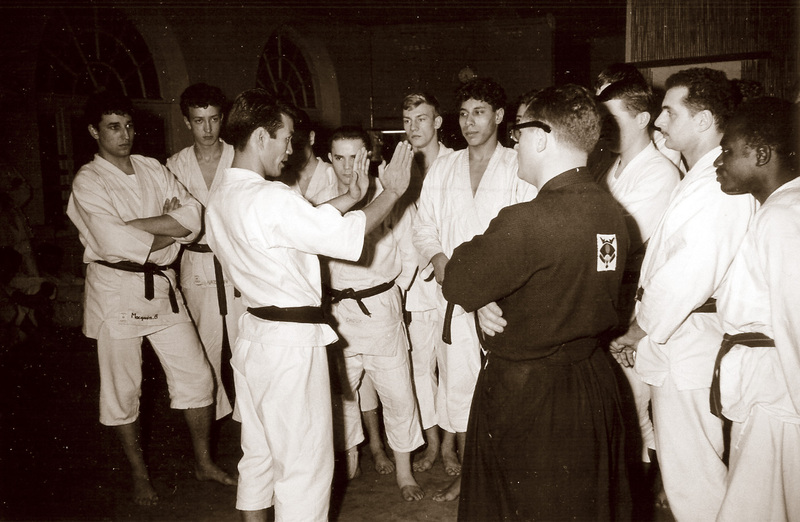 Byron Nelson requested that Mr. Ohshima start teaching at the main dojo on Olympic Blvd. At the same time, Mr. Ohshima became the only instructor at Caltech, and Nishiyama was informed that his services were no longer needed. 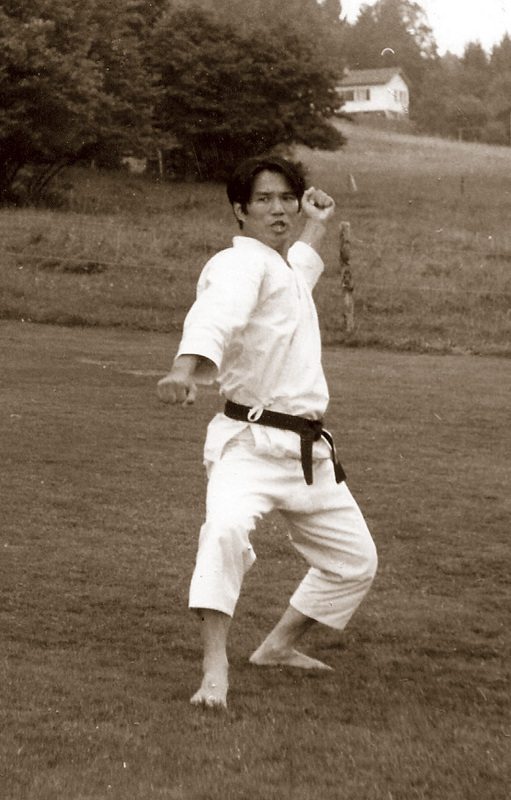 In September of the same year, Nishiyama left the SCKA to form the American Amateur Karate Federation (AAKF). 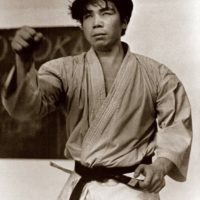 Unbeknownst to Mr. Ohshima, Nishiyama had opened a dojo less than a mile away and over 90% of the students left to join the AAFK. To augment his income, Mr. Ohshima started teaching Japanese at Maryknoll Catholic School in downtown Los Angeles. 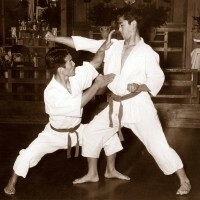 That is when a young Maryknoll student, John Teramoto, approached Mr. Ohshima to teach his friends karate. 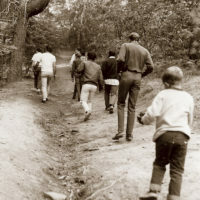 After refusing several times, Mr. Ohshima began a youth group supported by Father McKillop. 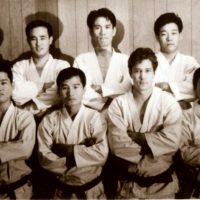 Within a few months, Mr. Ohshima and the SCKA decided to move the dojo to a new location because of the high rent and a small membership. A search for a new location was assigned to Stan Kachiro and Koji Sato. 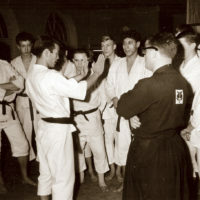 After searching throughout Los Angeles, Stan and Koji came upon a building that was a restaurant called the Normandie Kitchen on the corner of Berendo St. and Melrose Ave. With the help of France Borka and Buddy Bailey, they put the Melrose dojo together with a small group of volunteers. 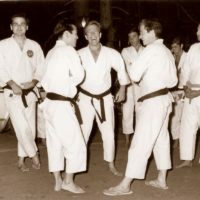 A group of karatekas from France decided to journey across the United States on a miserable bus trip to attend Special Training in the Summer of 1964. 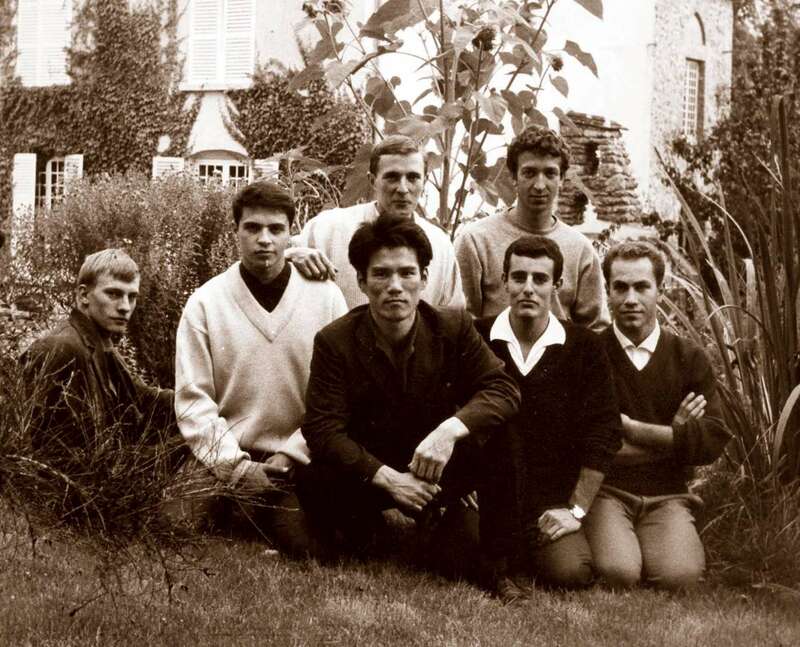 This group consisted of Daniel Chemla, John Lasry, Claude (Coco) Berdah, JeanPierre Gerbaulet, and Marc Bassis. After Special Training, Daniel Chemla and JeanPierre Gerbaulet took the dan test and received their black belts. 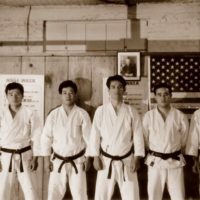 Although they were black belts in France, they chose to wear white belts until they were awarded their black belts from Mr. Ohshima. 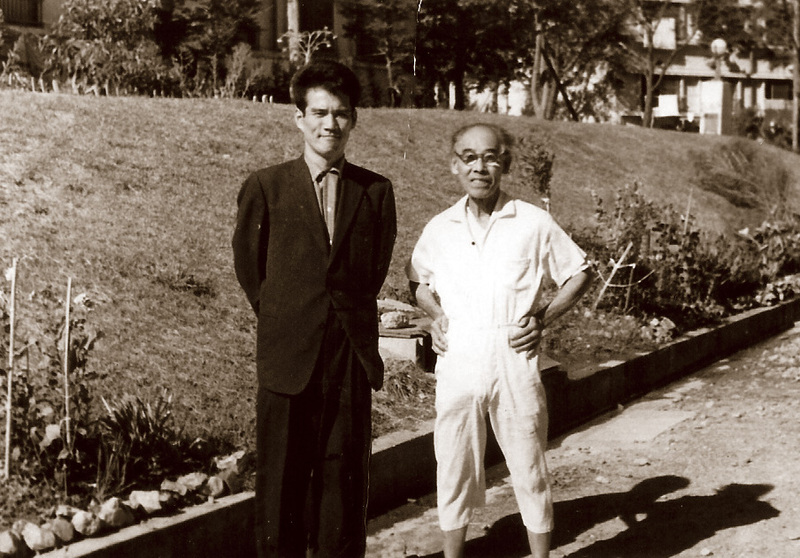 They stayed at Mr. Ohshima’s house, sold newspapers at night and trained during the day. 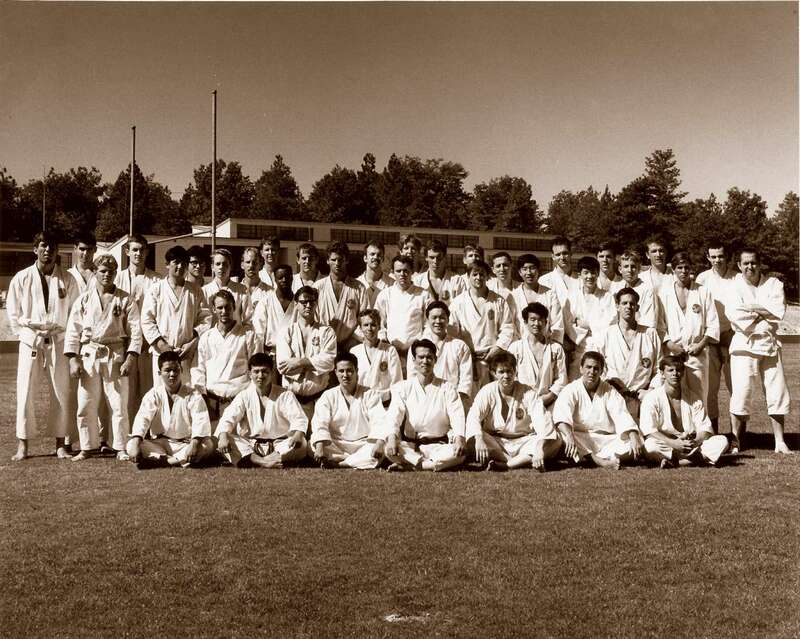 That year, Mr. Ohshima gave permission for the French black belts to establish France Shotokan. Several of the SCKA black belts won respect in karate circles with their tournaments fighting skills. The SCKA had a strong core of seniors under the leadership of Ohshima Sensei, including Sadaharu Honda, Jim Sagawa, Jordan Roth, Caylor Adkins and Mr. Ohara. Mr. Okabe and Mr. Yamagami arrived later from Japan. 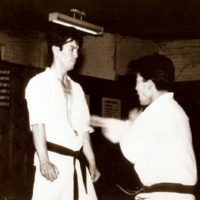 Mr. Ohshima faced everyone at special training in kumite. 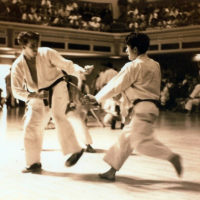 Frank Lopes attacks Buddy Bailey with a maegeri. 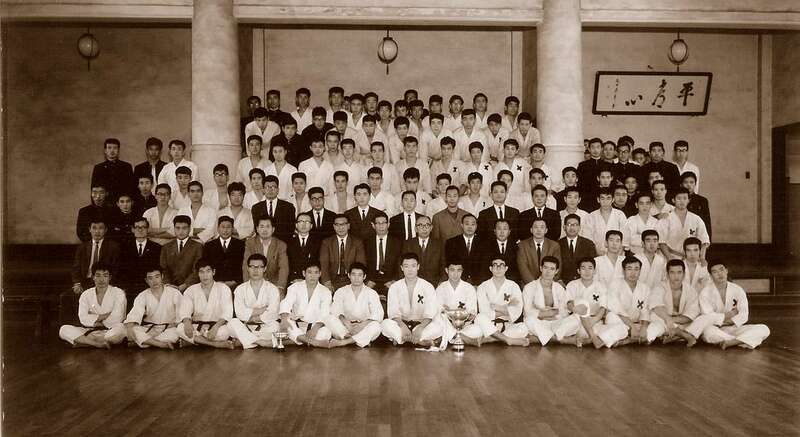 Waseda University Karate Club featuring several of Mr. Ohshima’s seniors (1965-66). 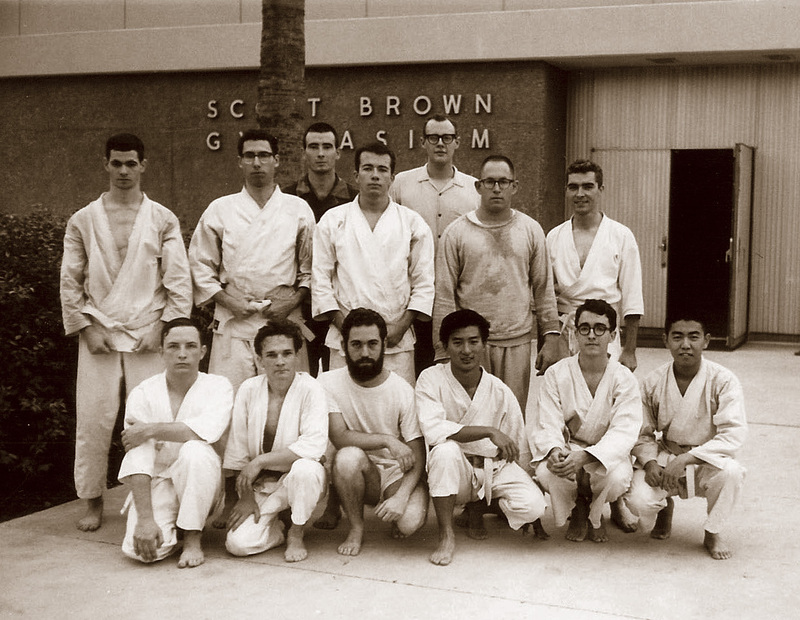 The 1965 Caltech Karate Club with Mr. Ohshima and Mr. Ohara after practice. 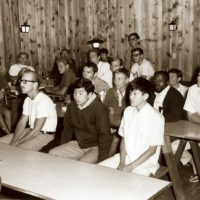 Sitting on the right of Mr. Ohshima is Doug Holford, 1966 Captain, and Floyd Herbert, 1965 Captain. Senior members of SCKA, l-r: Yoshiaki Yamagami, Sadaharu Honda, Mr. Ohshima, Mamoru Ohara, Shoji Okabe. 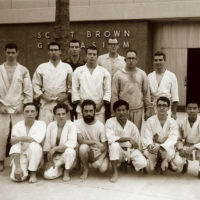 After a 1965 demonstration at Lincoln Park in Santa Monica, Mr. Ohshima gave France Borka, a sankyu and George Gamble, a gokyu, permission to open a dojo in Santa Monica. Mr. Shoji Okabe arrived from Japan to help polish the SCKA members. Summer Special Training was held at Lake Arrowhead and several guests outside of SCKA were invited to attend. 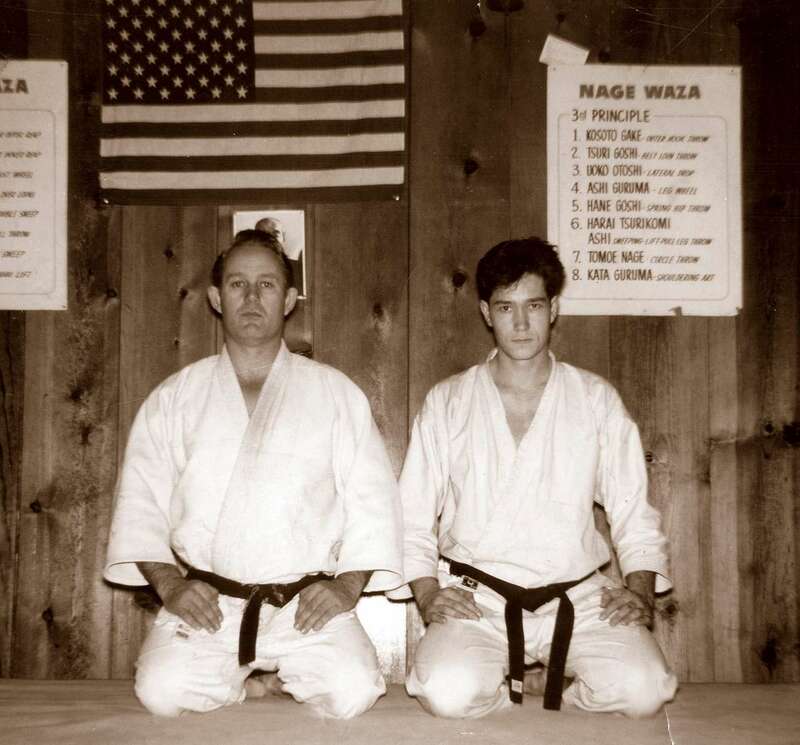 Ken Osborne, the first black belt student of Chuck Norris, joined the SCKA after completing Special Training. 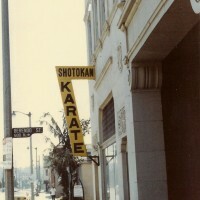 The following year, SCKA celebrated their 10th anniversary as the first Shotokan karate organization in America. 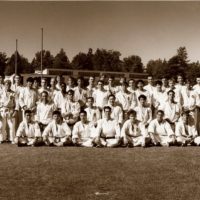 Old members gathered at Melrose dojo for a karate demonstration, kumite exhibition and later, the members attended a banquet. 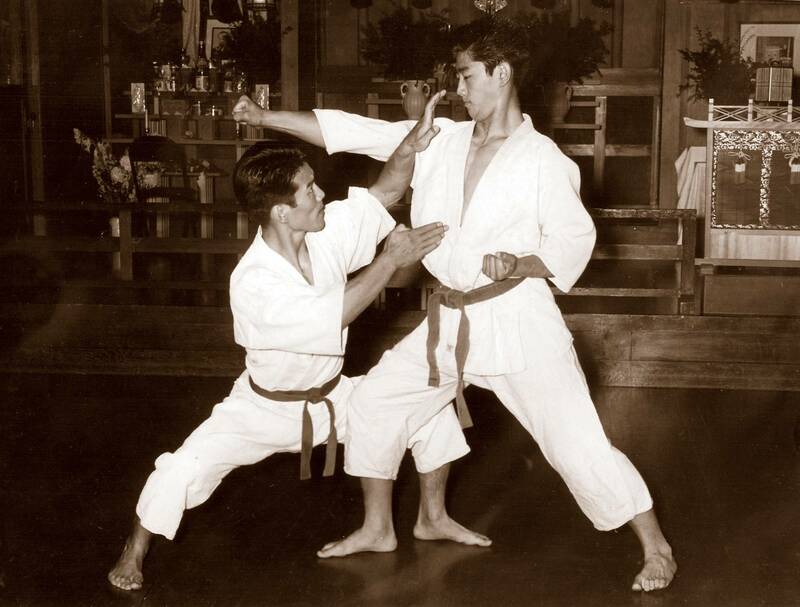 1966 also had Mr. Ohshima assume the position of Chief Instructor of the Swiss Karate Federation. 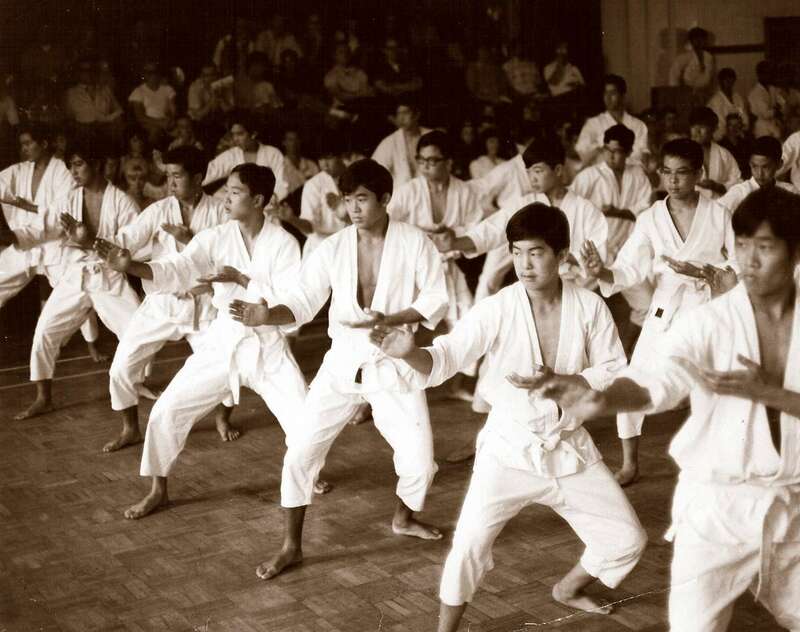 The organization was slowly expanding to different campuses across the United States, as young members enrolled in Shotokan Karate clubs at their universities and achieved their black belts. 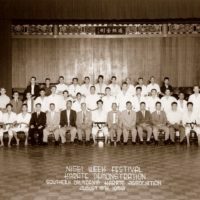 The second 10 years of SKA’s history began in February of 1967, when Mr. Ohshima brought his first group of students from America to tour and demonstrate in Japan. This type of trip was familiar to Mr. Ohshima, because 17 years earlier, he had taken a small group of Japanese experts to tour Okinawa. 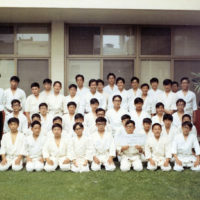 Thirty-six students of various levels from America, Canada and France, departed from Los Angeles for two weeks in “The Land of the Rising Sun.” This was a fulfillment of a dream for Mr. Ohshima: to demonstrate to Japan and his seniors that karate was being studied seriously in America and had spread so far. 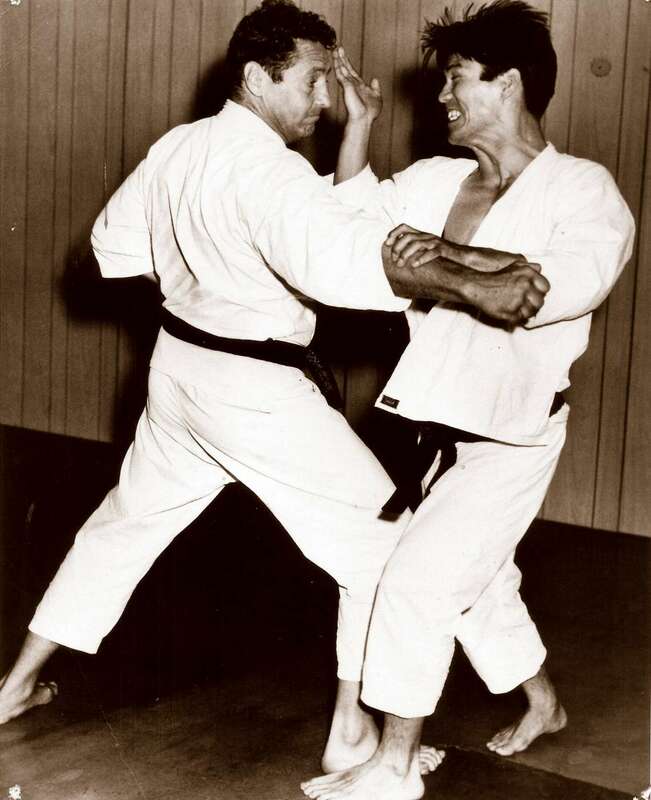 It was almost 10 years since Master Funakoshi had past away. 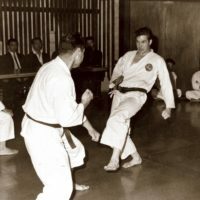 The group took part in exhibitions, exchange practices, and sparring matches at the National Gymnasium and with universities such as Waseda, Keio, Hosei, and Nihon, and meet the masters of several of the martial arts groups. 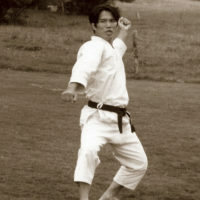 Master Sato treated everyone to a judo demonstration, while Master Uyeshiba’s son, Master Kisshomaru, exhibited aikido techniques. 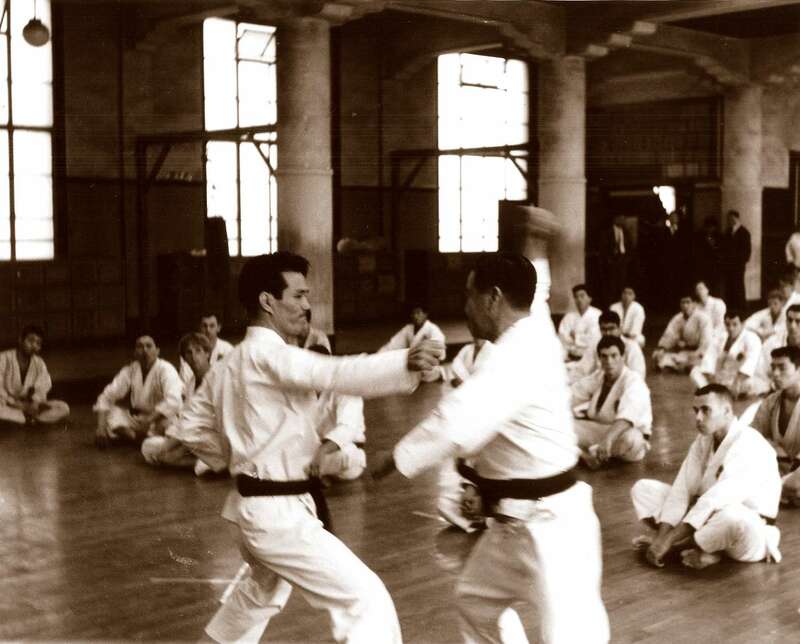 In Nagoya, Master Hironori Otsuka, founder of the Wadokai style also demonstrated. SCKA members visited dojos, temples and the countryside. They developed a bond with their fellow Japanese karateka, setting the stage for future exchange visits. The memories, the festivities, the sake and the kumite matches were memorable. There was a match between Lee Muhl and Yasunori Ono. 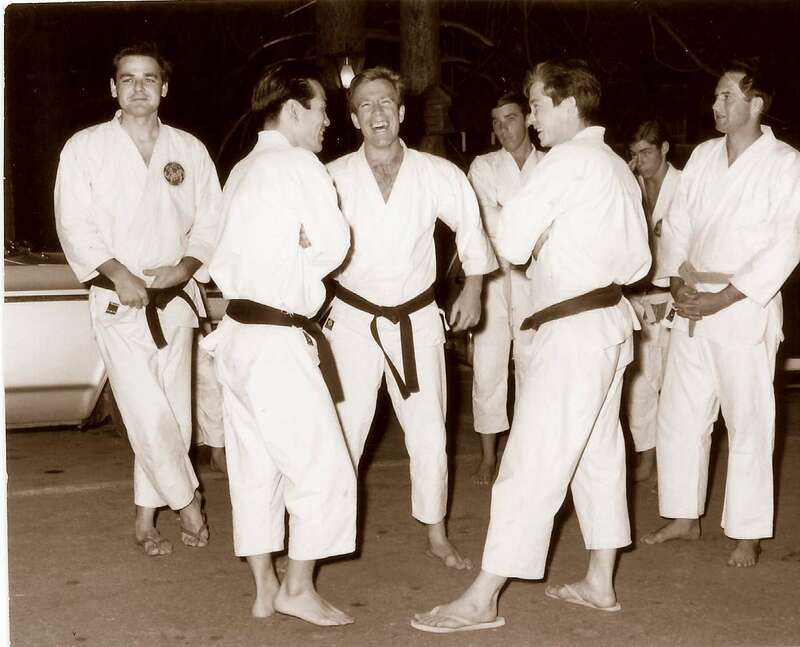 And the massive fists of Jordan Roth were imprinted on the faces of his opponents, resulting in Jordan being named “Tetsuisan,” which means “Iron Fist,” by his Japanese friends. The experience was legendary. A dream was fulfilled for Mr. Ohshima and the SCKA. This was the beginning of many cultural exchange karate tours in SKA’s future. 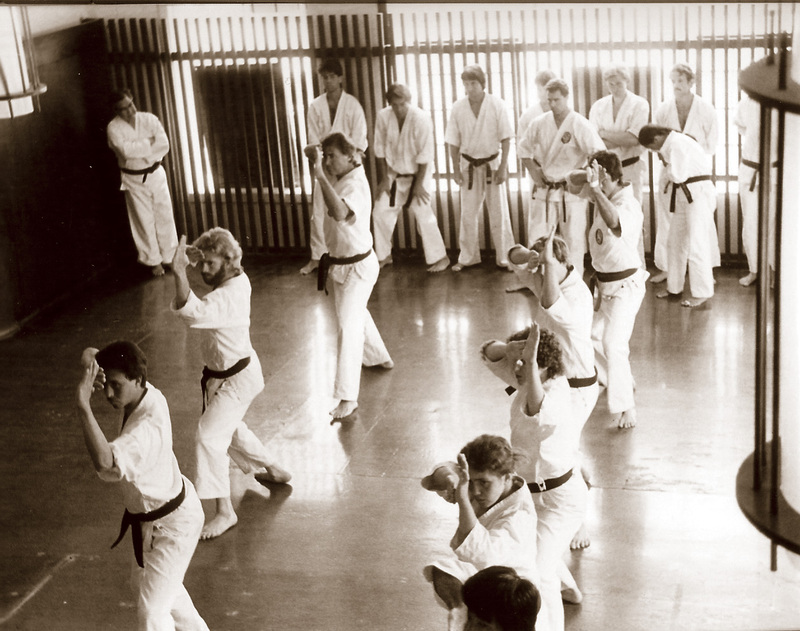 In the early years at Melrose dojo, black belt practices were held on Sunday mornings. 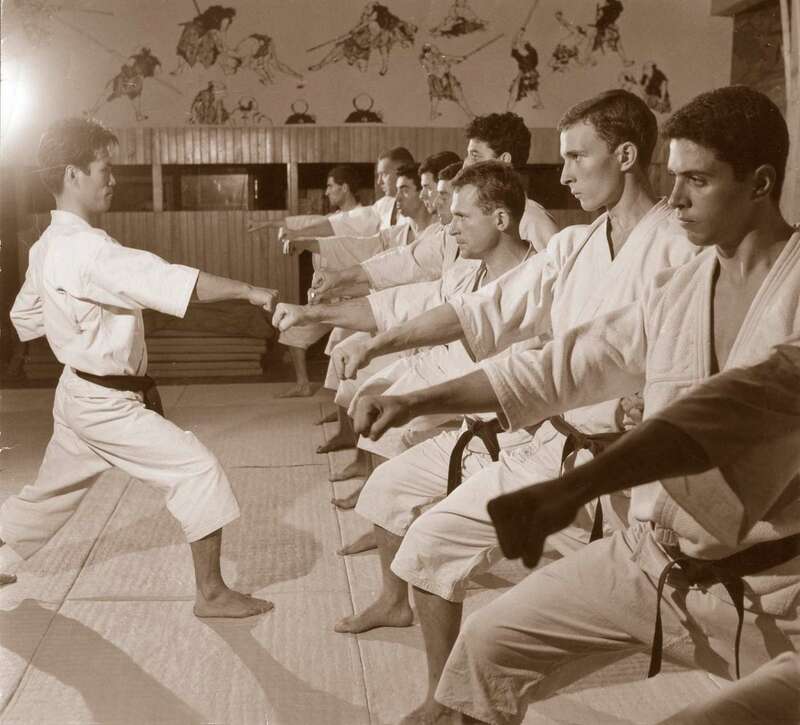 Black belt practice during the early years at Melrose Dojo were held every Saturday morning. Members who completed the 1965 summer special training at Lake Arrowhead pose for a group photo. 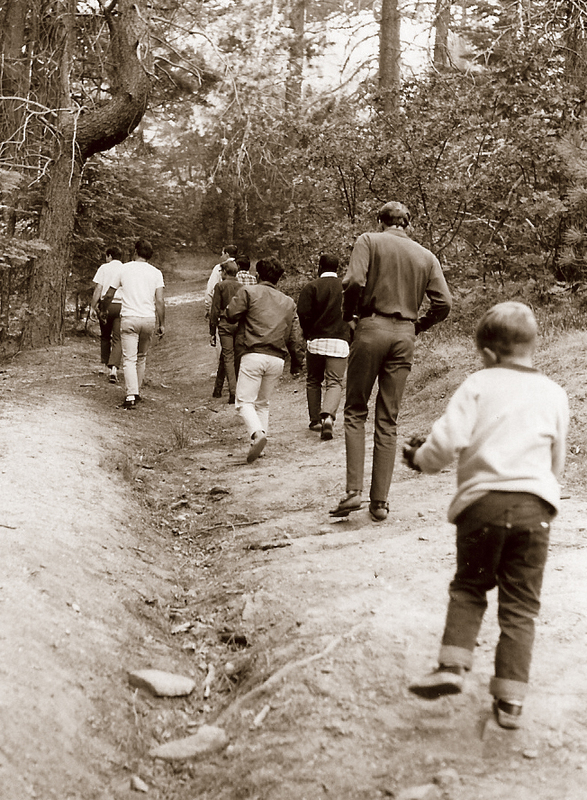 Before summer special training at Lake Arrowhead started, members cleared the trail of rocks with family members in 1966. Several spouses came and cooked the meals for the participants. 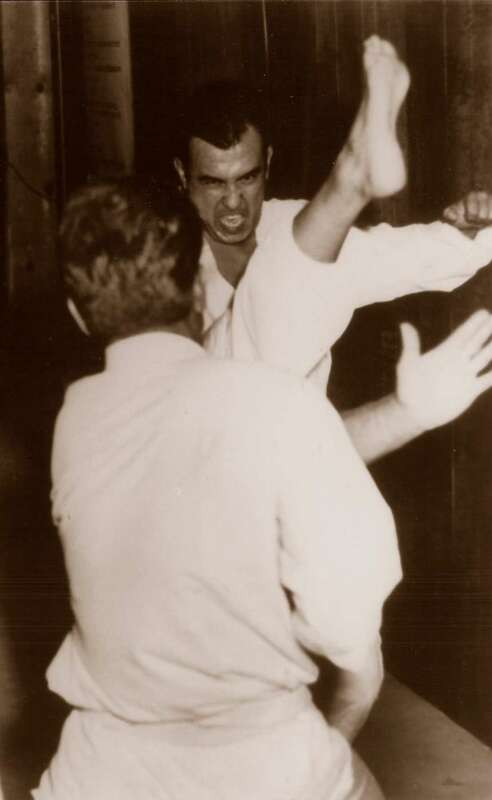 Jordan Roth faces Caylor Adkins (1965). 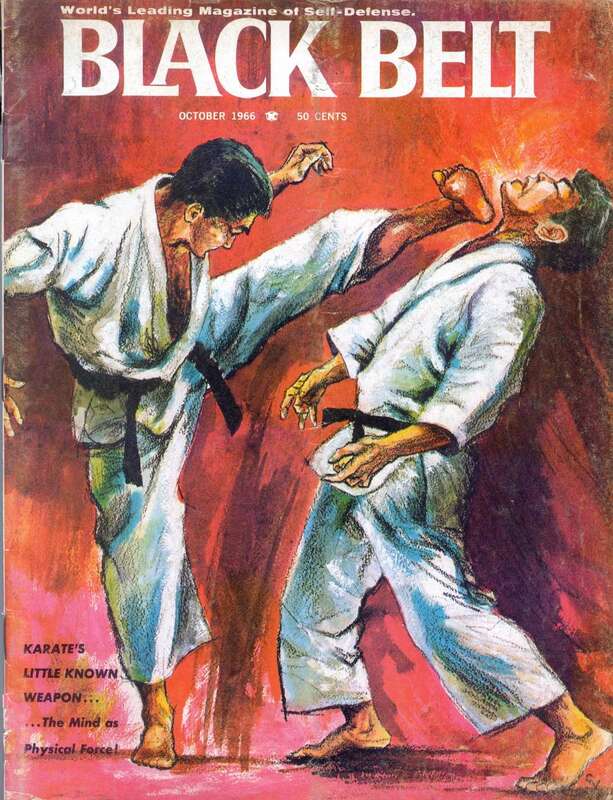 October, 1966 Black Belt Magazine had a major article on Mr. Ohshima and the SCKA. 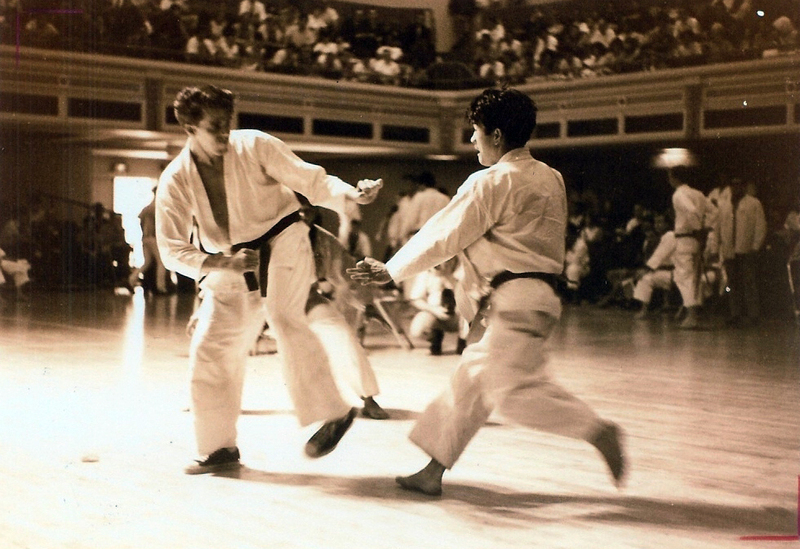 1966 group kata, Heian Yodan, performed at Nisei Week by Maryknoll Karate Club. 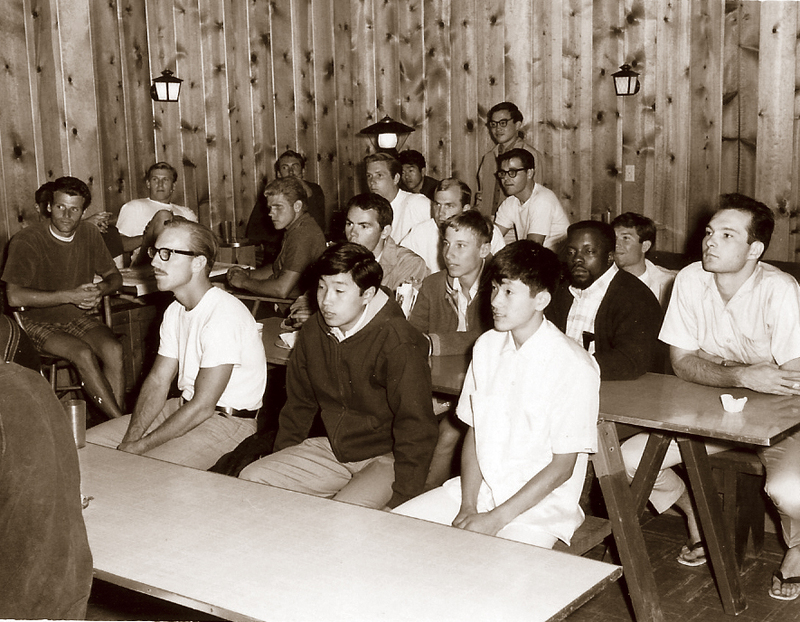 Participants listen intently to Mr. Ohshima’s lecture at 1966 summer special training. 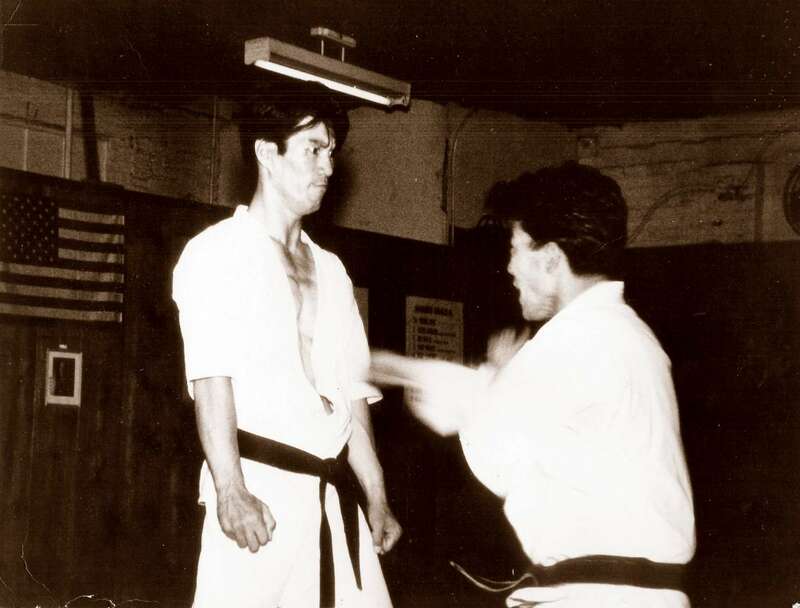 Chuck Norris, a guest at the 1965 summer special training, chats with Mr. Ohshima before the first practice. 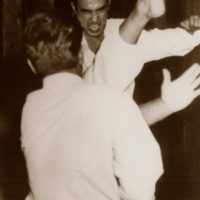 Ohshima Sensei faces Mr. Honda with fierce eyes at Long Beach Dojo. 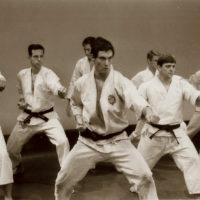 Jordan Roth, Bob Postle, Lee Muhl, and France Borka demonstrate on Japanese television. 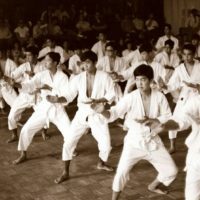 American karate viewed for the first time by the Japanese public. 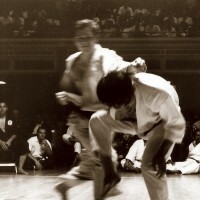 Mr. Momaru Ohara demonstrates uraken as a counter to Mr. Shoji Okabe during the 1967 Nisei Week Exhibition and Tournament. 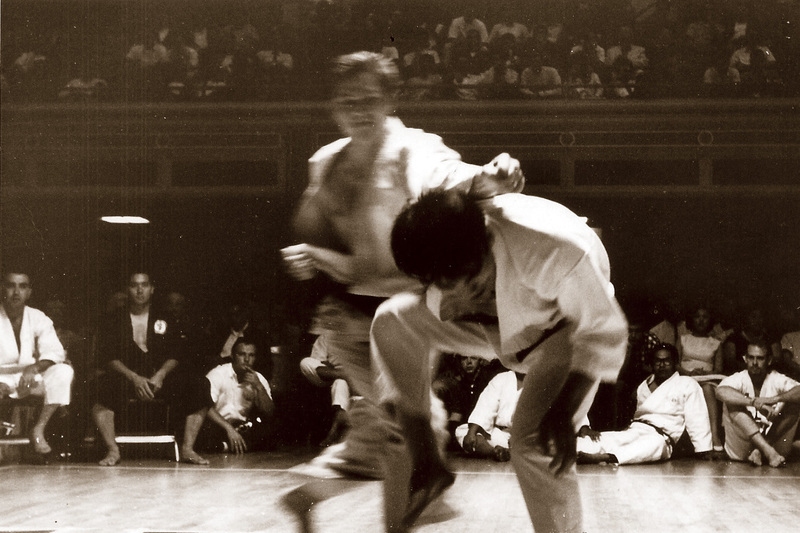 Mr. Ohshima attacks Senior Hiroshi Kamata at Waseda University during the 1967 American Tour to Japan. 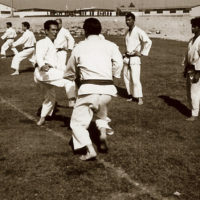 Mr. Ohshima performing Heian Godan during kata practice at special training (1965). 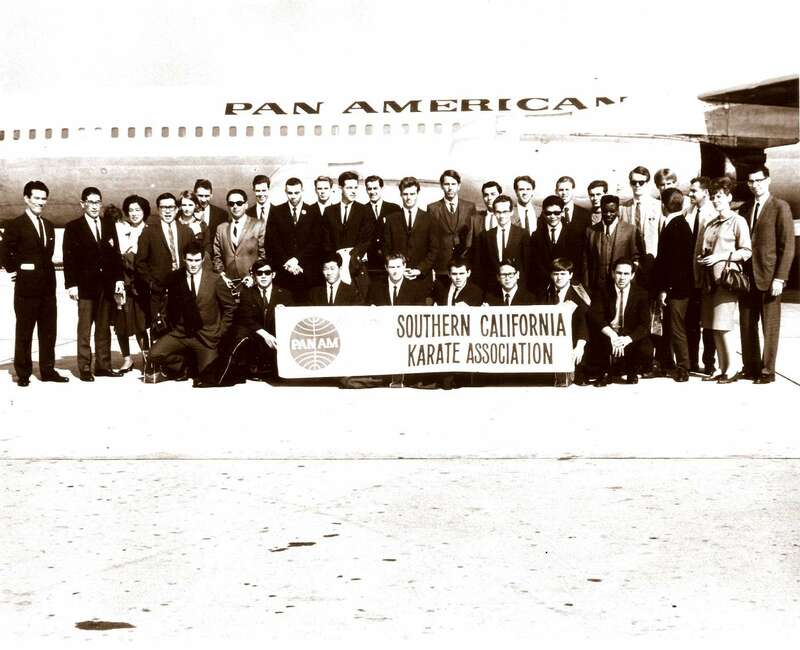 Historical 1967 first U.S. Karate Tour participants pose for a group photo before departing to Japan. 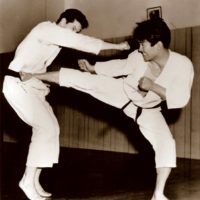 Yasunori Ono, former captain of the Waseda Karate Club, stayed two years leaving many punches on black belts before returning to Japan. 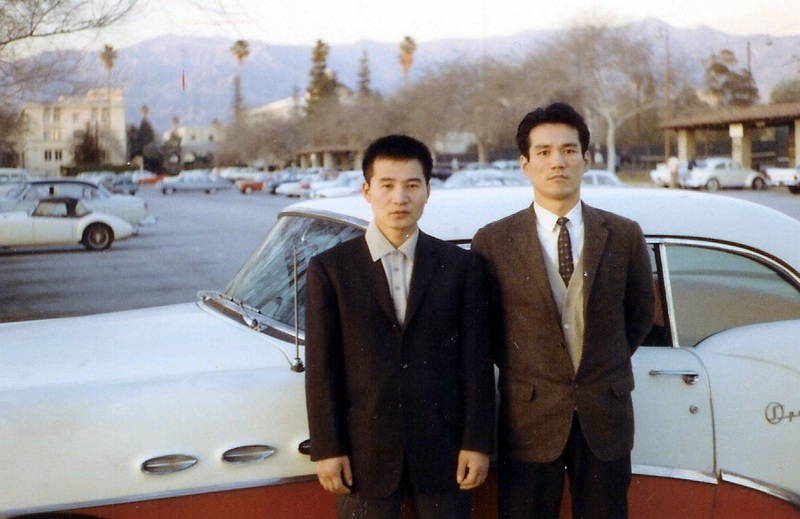 Mr. Ohshima and Yoshiaki Yamagami standing in front of Mr. Ohshima’s famous Buick Special. The next two years were filled with activities, as each dojo and karate club formed a strong core of seniors. 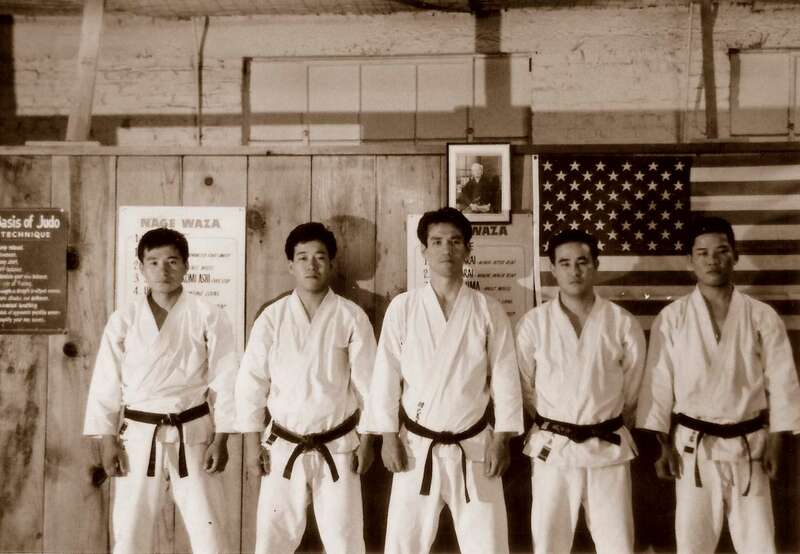 Special Training was held in Lake Arrowhead in the summer, and Mr. Mamoru Ohara departed for Japan after teaching for the SCKA for three years in Illinois, Kansas and California. Mr. Keisuke Nakagawa, who faced Jordan Roth in Japan the previous year, visited many of SCKA’s dojos. 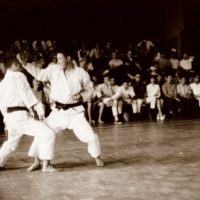 The 11th Nisei Week Exhibition and Tournament was exciting, and the SCKA developed a reputation of high respect, thanks to the tireless effort of Sensei and the seniors. 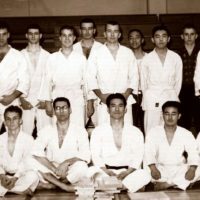 The following year, Mr. Yoshiaki Yamagami (captain of Waseda in 1962), left for Japan after teaching karate to the Shotokan club in Pittsburgh. 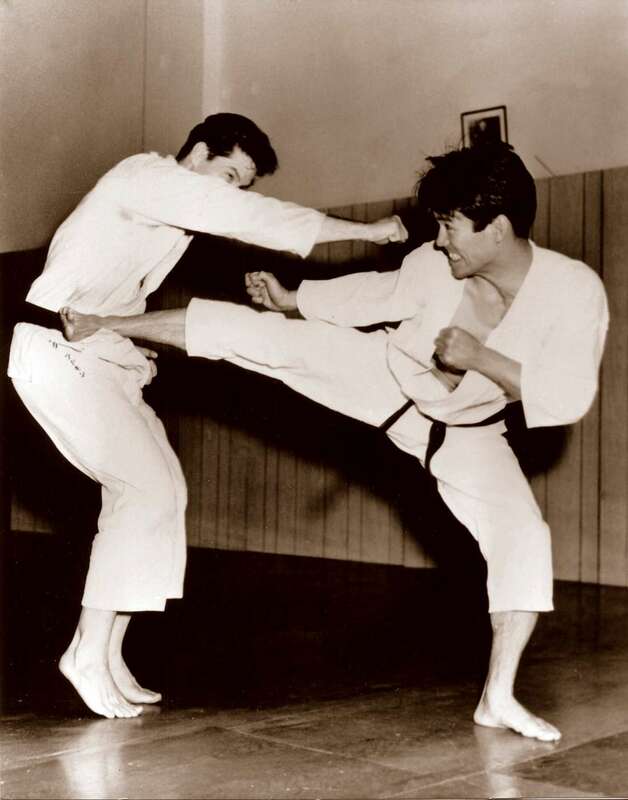 Appearing on the scene was Mr. Yasunori Ono, captain of Waseda in 1966, and champion of the All-Japan University Karate League. 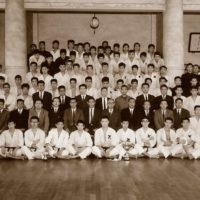 In 1968, the SCKA was honored by the visit of Senior Isao Obata, who was captain of Keio University’s first karate club in 1923. On October 27, Master Hironi Otsuka visited Mr. Ohshima and the SCKA dojos. The SCKA had visited him in Nagoya on the 1967 tour. 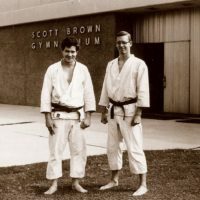 SCKA’s membership had spread extensively throughout the United States with the help of many senior black belts from Waseda. 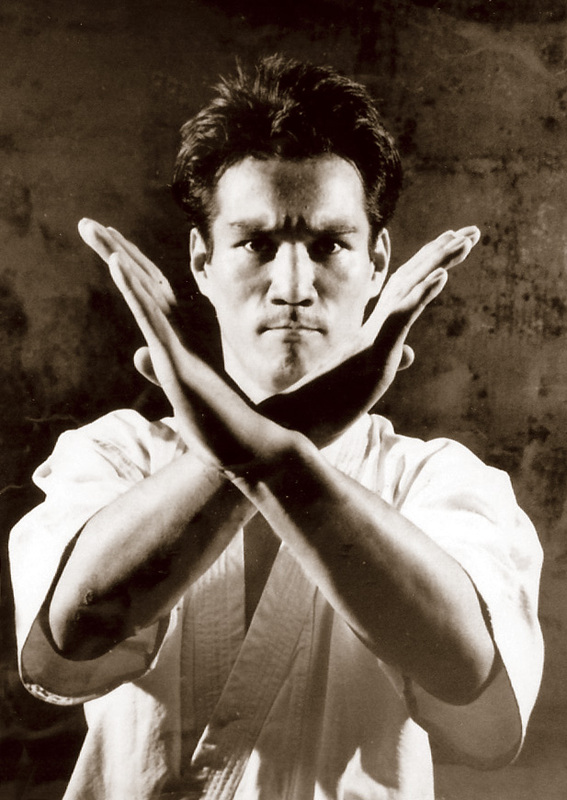 It was decided to transform the SCKA into a nationwide, nonprofit organization, Shotokan Karate of America (SKA). The membership card maintained the same design for the next few years.